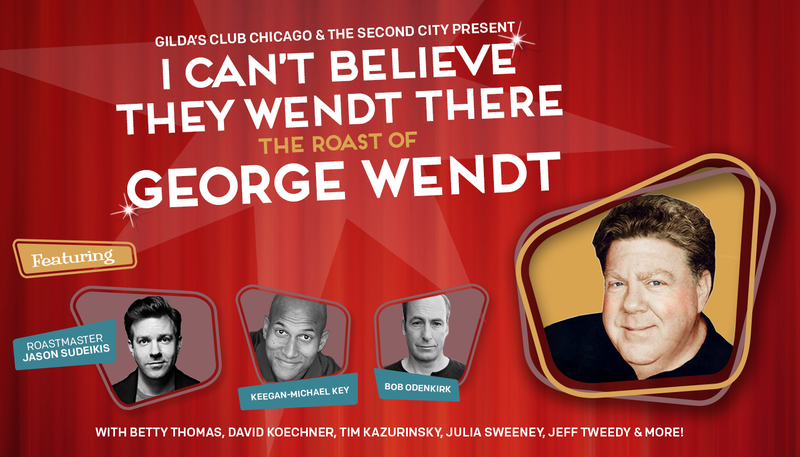 It’s a night guaranteed to destroy one of the world’s most beloved comedy legends, George Wendt–all in the name of charity. Join Roastmaster Jason Sudeikis, Bob Odenkirk, Keegan-Michael Key, Betty Thomas, David Koechner, Tim Kazurinsky, David Rasche, Julia Sweeney, Wilco’s Jeff Tweedy, and a growing list of the biggest and brightest names in comedy for this once-in-a-lifetime evening of comedy and camaraderie to benefit Gilda’s Club Chicago and The Second City Alumni Fund, hosted at Chicago’s iconic Mainstage at The Second City. Founded in honor of the late Gilda Radner, Gilda’s Club works to ensure that all people impacted by cancer are empowered by knowledge, strengthened by action and sustained by community. The Second City Alumni Fund has raised over $500,000 and counting for alumni with health and financial challenges. Top Shelf: SELECT TICKETS JUST ADDED! 6:00pm-6:45pm Pre-show VIP reception inside Second City’s historic complex at 1959 Kitchen & Bar. Includes a photo opportunity with George & Jason. Appetizers and top shelf open bar service provided. 6:00pm Backstage experience led by Second City’s Behind the Bentwood tour guides, including special surprise guests. Fred Willard really wants you to come! Don’t upset Fred Willard. Can’t make the show? We’ve got some great prizes we are auctioning off for our charities. Check them out HERE.